It has occured to me that I’m doing this all backwards. I’ve been writing these editing posts first and trying to make the following poem match my predictions, when I should have been fixing the poem and then writing about what changed… wow, sorry about the weirdness. I wrote a paper about how she is not a bird, she is a fish, I’ll post it if I can ever find the final copy. I presented at a conference and everything, it was a rather novel idea. This poem, like my relationship with the novel, has taken a similar turn. From being about birds in the handwritten version to being about sailing in the revised. This is a perfect example of how editing and time can really affect the final work. The poem will do what it needs to come to grips with what th ideas are. As I was still in a tumultuous time when this was first written, I was looking at summer and later birds, when I should have followed my gut. The whole metaphor changes drastically, but the message of following an ideal and trusting a voice you cannot meet is made all the more clear. And though I often warn about poems with too little lines to really edit, this is an example of how a complete face life can be better than a point-solve editing tactic. We get the same ideas, we get the same subject, but I feel more complete with the final line, and the feminism is subtle but present. And though sailing, like novels, tended to be a mainly manculine, the signs are there for a gender neutrality that Chopin suggests with her refusal of roles in her work. The allusions are subtle but require a little pulling. In this case, you’re not really in on the bigger picture unless you know a thing or two about the novel and the ideas that surround it. Also, I’ve again fallen on fish as my symbol for success and freedom… this will happen over and over in my work. I am not so worried about a crutch here as a pattern that I need to mantain with the upmost integrity. When I get lazy, then I will worry about the fish as a fall back. Here I believe it works. Edit twice, three times. 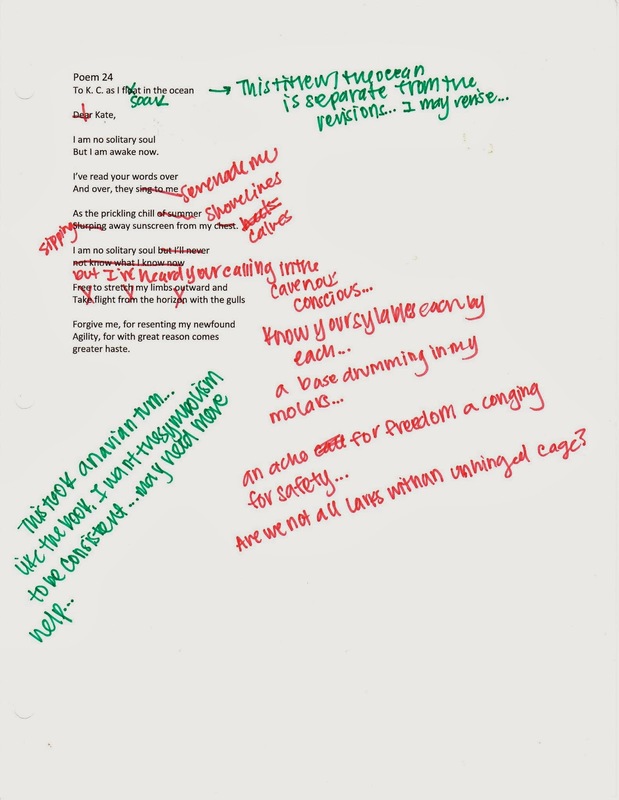 As the poem changes, you may see the ideas present themselves. As a writer, you have complex and deep ideas that may manafest in your work that hide in early drafts. Work them to the surface, or lose a poem to its first sloppy draft. As a reader we analyze what might be there, form our own ideas, as a poet we must present the clearest, richest work for others to pick apart. Do you want to be part of the cannon or not? Haha, that’s a trick question, you wouldn’t know if you got in the cannon until you’re dead.